Families in search of a home with plenty of space will not be disappointed by the Alder. This two-story house plan boasts a finished floor space of 3,118 square feet and a total area of 4,502 square feet. It has a two-car garage, 4 bedrooms, and 2.5 baths, as well as a covered porch and a laundry area. The 4 bedrooms are found on the second floor. All bedrooms have their own walk-in closet. 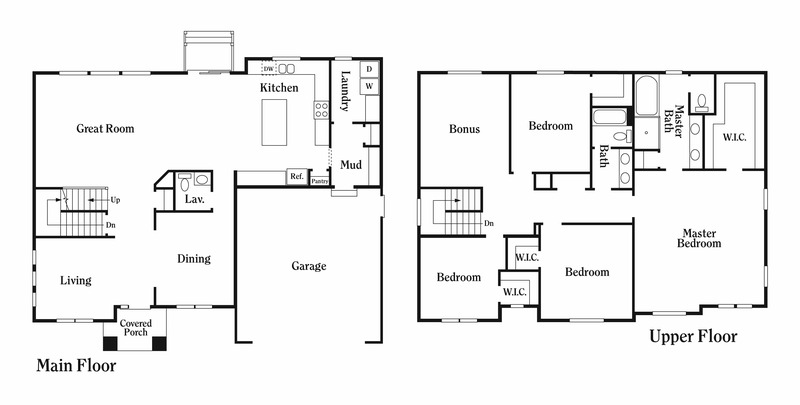 There’s a master bedroom with its own master bath, as well as 3 bedrooms, a bonus room, and a shared full bath. The first floor has separate living and dining rooms, a great room with an incorporated island kitchen, and a lavatory. The Alder is just one of the house plans offered by Perry Homes, a trusted builder of heritage homes in Utah. Our company offers a seamless construction process that’s backed by 40 years of experience in the business. We provide beautiful house designs, endless customization options, and premium construction at affordable rates. What’s more, we’re also known for offering excellent customer service. Customizing the Alder and making it truly your own is a breeze, especially with the assistance of our design specialist. Our personnel will walk you through every design option available for your chosen house plan. We’ll start building after the design has been finalized. This way, our clients will be ensured of a quick construction process. Get in touch with Perry Homes Utah today and start making your dream home a reality. Call us at 801-264-8800 or leave a message on our Contact Us page.